For a long time, Italy was the focal point in European painting. Cities like Florence and Rome had been the nurseries of the southern Renaissance, Venice and others were of great importance too. The Roman campagna was the birthplace of plein air oil painting, and the place to be for any landscape painter, whether you came from Oslo or Munich. Rome was also the city in which the two great French pioneers of landscape painting worked for much of their careers. Nicolas Poussin came from Normandy, and Claude Lorrain from the Vosges, in the east of France, but they achieved greatness only when in Rome. The strange thing is that landscape painting was largely imported to Rome from northern Europe. As landscapes burst out of their confines in the background of fifteenth century paintings, and the likes of Joachim Patinir (c 1480-1524) started regarding themselves as primarily landscape painters, the new genre developed in the north. One of its early and most important exponents was Paul Bril (c 1553/4–1626), who trained and started his career in Antwerp, but spent much of it in Rome. Bril moved to Rome in around 1582, when he was in his late twenties – fully trained, experienced as a Master in his own right, and seeking to develop and flourish with the rich commissions which could come from the Pope and other officers of the church. His brother Matthijs had been in Rome for several years when Paul arrived, and had already been working on frescoes in the Vatican. 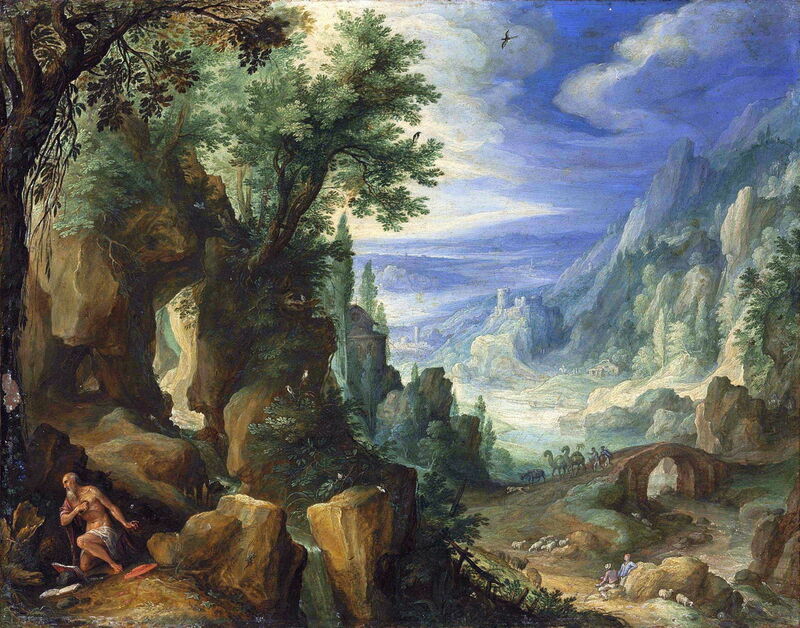 Paul Bril (c 1553/4–1626), Mountainous Landscape with Saint Jerome (1592), oil on copper mounted on panel, 25.7 × 32.8 cm, Koninklijk Kabinet van Schilderijen Mauritshuis, The Hague, The Netherlands. Wikimedia Commons. Paul Bril’s work did not disappoint. This Mountainous Landscape with Saint Jerome from 1592, painted on copper, is small but wonderful. He was granted commissions by Pope Gregorius XIII, and his successor (in 1585) Sixtus V became his main patron. 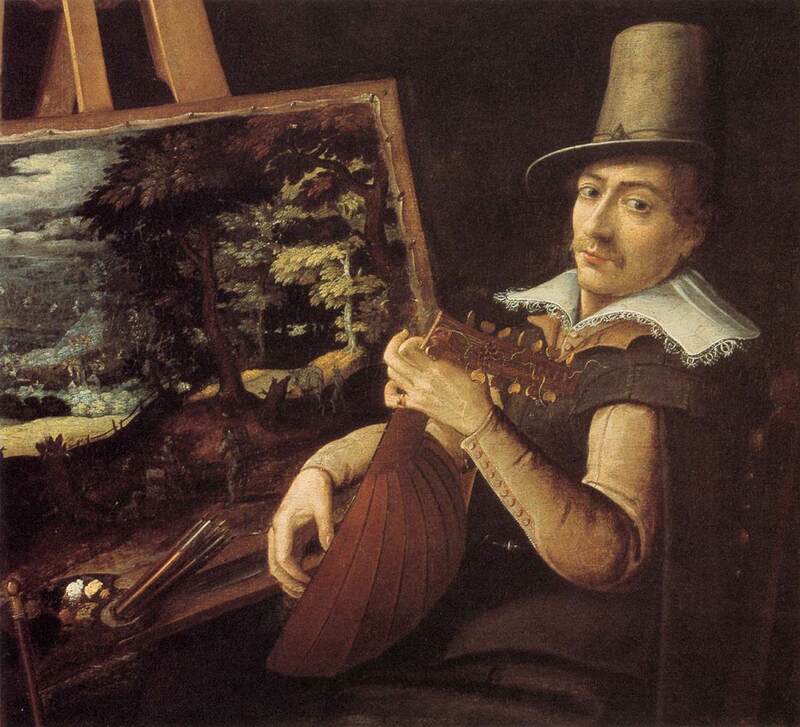 Paul Bril (c 1553/4–1626), Self-portrait (1595-1600), oil on canvas, 71 x 78 cm, Museum of Art, Rhode Island School of Design, Providence, RI. Wikimedia Commons. By the end of the sixteenth century, when he painted his Self-portrait (1595-1600), he was a key member of the team who painted landscapes for most of the major frescoes of the day. 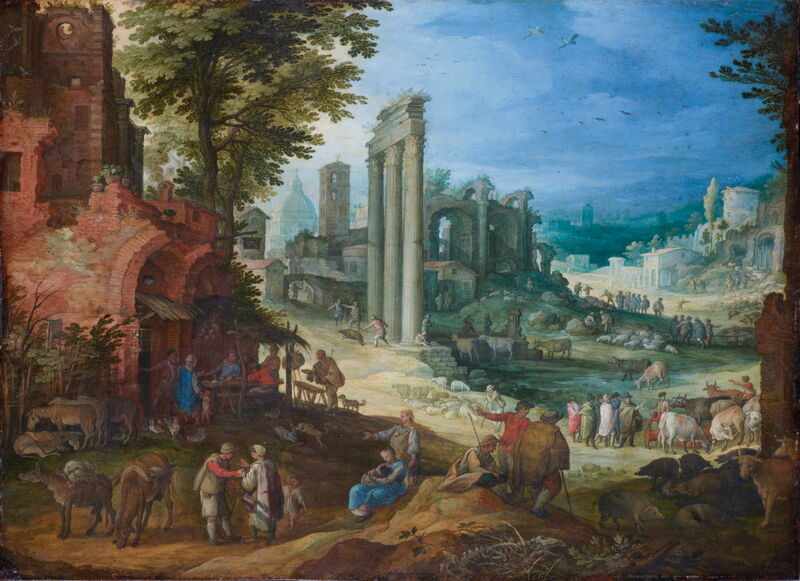 Bril found time to paint some ‘proper’ landscapes too, including this superb View of the Roman Forum in 1600. This shows livestock wandering across what had been the very centre of life in classical Rome, with the remaining columns of the temples of Castor and Pollux, and Hadrian’s Basilica. Bril was not just a fine landscape painter, but his figures are lifelike, and engaged in everyday activities – excellent staffage which brings the whole view to life. Paul Bril (c 1553/4–1626), View of Bracciano (c 1622), oil on canvas, 74.5 x 163.6 cm, Art Gallery of South Australia, Adelaide, South Australia. Wikimedia Commons. But my favourite landscape by Bril is his panoramic View of Bracciano (c 1622). Although it is very Italianate, it is a painting ahead of its time: a fairly accurate depiction of a real place, with all sorts of fascinating little scenes within it, like the young boy doffing his hat to the passing dignitary in his coach with armed guard. At some stage between those last two paintings, Bril taught a succession of students, of whom the most (in)famous must be Agostino Tassi (1580–1644). Tassi is one of those people who you just cannot seem to trust. He was born in Perugia, the capital of Umbria in central Italy, but claimed to have been born in Rome. His real family name was Buonamici, but he adopted the name of Tassi because he claimed to have been adopted by the Marchese Tassi, when he was really the son of a furrier. He seems to have wandered around during his early adulthood, possibly staying in Livorno and Florence. While in the latter city, he ended up in a convict galley, which implies that he was convicted of a crime, but seems to have painted on the galley rather than pulling its oars with the rest of the convicts. At some time around the turn of the seventeenth century, Tassi seems to have been a pupil of Paul Bril’s in Rome. With so many claims and counter-claims about his life, it is hard to be sure, but it is thought that some of Tassi’s maritime paintings resulted from that training. Afterwards, Tassi went on to gain commissions from Pope Paul V, which brought him into contact with Orazio Gentileschi. The two worked together in Rome from about 1611. Agostino Tassi (1580–1644), Imaginary Landscape with Temple of Sibyl at Tivoli (c 1625), fresco, dimensions not known, Palazzo Lancelotti, Rome. Wikimedia Commons. Most of Tassi’s surviving works appear to be frescoes, and later in his career his workshop seems to have flourished from those commissions in and around Rome. 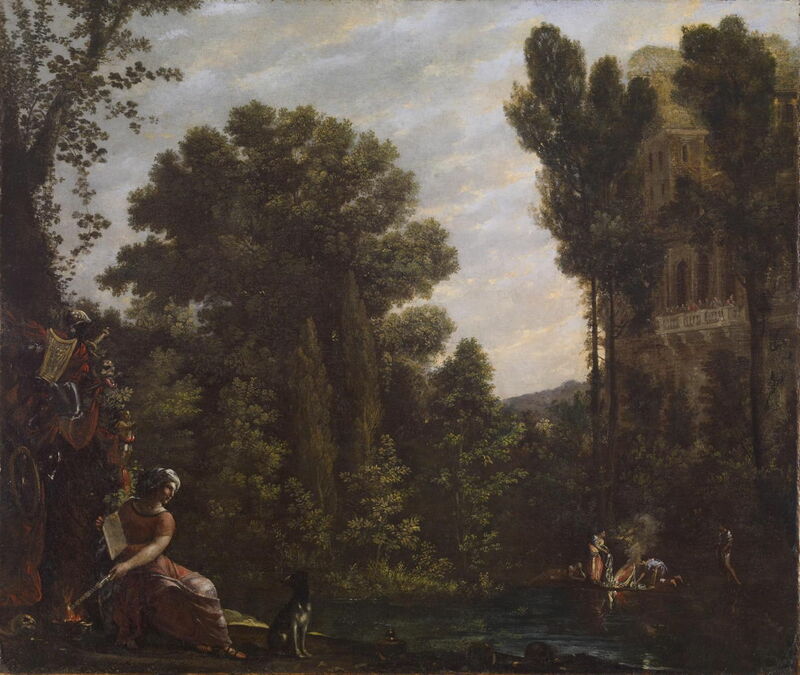 One of his best landscapes appears to be this Imaginary Landscape with Temple of Sibyl at Tivoli (c 1625) in the Palazzo Lancelotti in Rome. The contrast between that and Bril’s View of the Roman Forum is stark. Agostino Tassi (1580–1644), Landscape with a Scene of Witchcraft (1620-44), oil on canvas, 63.2 x 74.5 cm, Walters Art Museum, Baltimore, MD. Wikimedia Commons. Few of his easel paintings seem to have survived. Of those that have, few seem to show much influence from Paul Bril. His Landscape with a Scene of Witchcraft (1620-44), now in the Walters in Baltimore, MD, is perhaps the most accessible. His other easel paintings seem to be mainly architectural, good demonstrations of his skill at perspective projection, but little evidence of any formative years with Bril’s tutelage. Tassi is barely known as a painter any more, although in his day he was a key link in the chain between the northern landscape art of Patinir and the nascent genre in Italy. He is not famous, but infamous, because of his relationship with a pupil: Orazio Gentileschi’s daughter, Artemisia. Posted in General, Life, Painting and tagged Bril, Gentileschi, landscape, painting, Patinir, renaissance, Tassi. Bookmark the permalink.